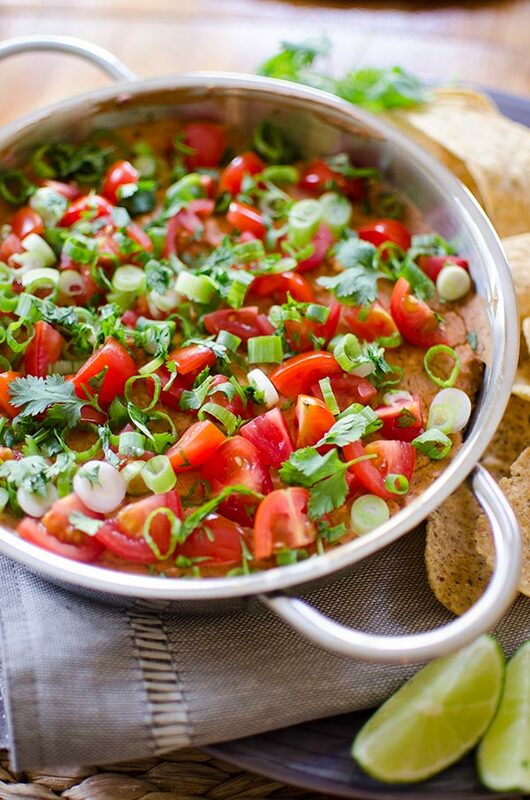 A cheesy refried bean dip packed with flavour from cumin and chili powder and served with fresh tomatoes, green onions and cilantro and made with Philly Cheddar. Seven layer dip is one of my favourite things ever. Whenever I’m at a potluck with seven layer dip, you can almost guarantee that I’ll situate myself somewhere right next to it. This cheesy refried bean dip has all the flavours of a seven layer dip, in one simple dip. Summer has un-officially kicked off for us here in Canada, with May 2-4 long weekend happening right now. This is the first long weekend of the summer, and people love it. We’re lucky because this year the weather has been absolutely gorgeous. I’m heading up north to the cottage today, and will definitely be making a batch of this refried bean dip to eat on the dock by the lake. Talk about dreamy. 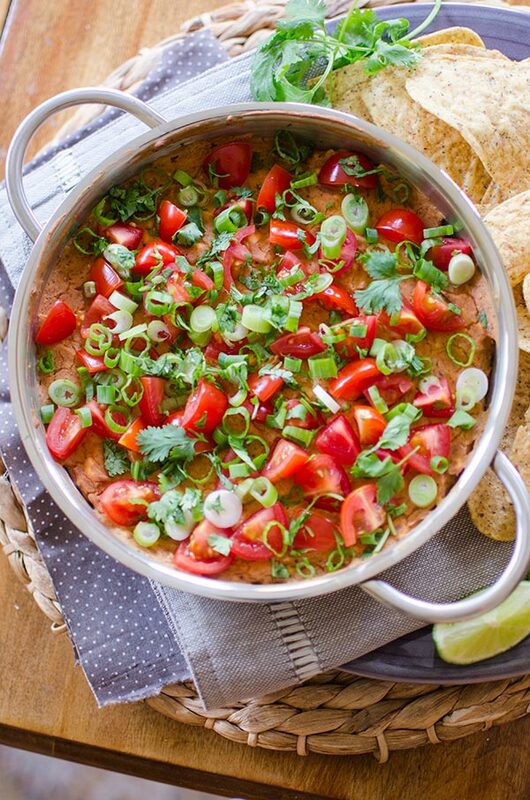 This dip isn’t just your typical refried bean dip; it’s made with refried beans of course but also some cumin and chili powder, a hit of lime and sprinkled with tomatoes, green onions and cilantro. So where does the “cheesy” come from? Well, for this dip, I was inspired by their recipe for cheesy refried bean dip I found on the Philly Creamy Cheddar Cream Cheese Snacking Recipes page. The dip was delicious as-is, with the creamy cheddar cream cheese but I couldn’t resist adding a few Living Lou flairs to it so I added a dash of spice and a hit of lime and cilantro (because I love cilantro). This dip is served warm, straight out of the oven! If you have any leftover, it can be refrigerated and reheated in the microwave. That said, I doubt you’ll have any leftover if you’re serving to a crowd. If you’re not serving this as an appetizer, it’s the perfect dip to serve with other Mexican-style dishes like slow cooker chicken tacos or rice and beans. Let me know if you give this recipe a try in the comments below. Looking for a deliciously simple dip recipe? 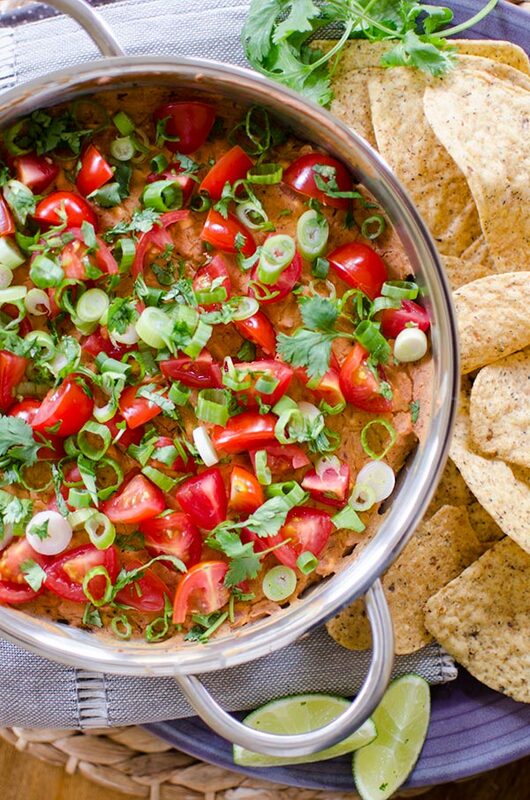 Our yummy Cheesy Refried Bean Dip couldn't be easier to make. Best of all, it's a guaranteed crowd pleaser! Mix cream cheese product, beans, garlic, lime juice, chili powder, cumin and cayenne until blended. Top with tomatoes, onions and cilantro. Disclosure: This post was sponsored by KraftHeinz Canada – as always, all opinions are my own. Thank you for supporting my sponsors and allowing me to continue creating content like this cheesy refried bean dip! i've tried on of its italian type, excited to try this one toooo. This is delicious and great to serve with friends! Thank you Louisa. Thanks, Fiori! It's such a great dish for sharing!